This small tree rarely reaches a height of 30 feet or a trunk up to 12" in diameter. The crown consists of numerous spreading branches and branchlets. Dry, gravelly mesas, the sides of low canyons, and the banks of mountain streams from the Rio Grande valley westward. Tree reaches its largest size in the Uvalde area. The small, compound leaves have 2 to 4 pairs of pinnae, each with 2 to 6 pairs of leaflets. Leaflet size is 0.25" to 0.5" long. Twigs are smooth pale brown or red, usually armed with stout curved prickles or "catclaws." The fragrant, yellowish-to-white flowers appear during the summer in dense, oblong spikes about an inch long, usually 2 to 3 in a cluster at the end of a branch. A flattened pod, often twisted or distorted, 2" to 4" long by about 0.75" wide. The pod narrows between each of the 6 to 8 seeds, which are nearly round, flattened, dark brown and shiny. The pods hang unopened on the branches until the winter or the following spring. Thin and gray to brown on young stems, then dark and breaking into flattened ridges with age and size. Wood is heavy, hard, strong, close-grained, durable, and clear brown or red in color. Sometimes used for fenceposts. Flowers produce excellent honey. Gregg acacia (Acacia greggii var. 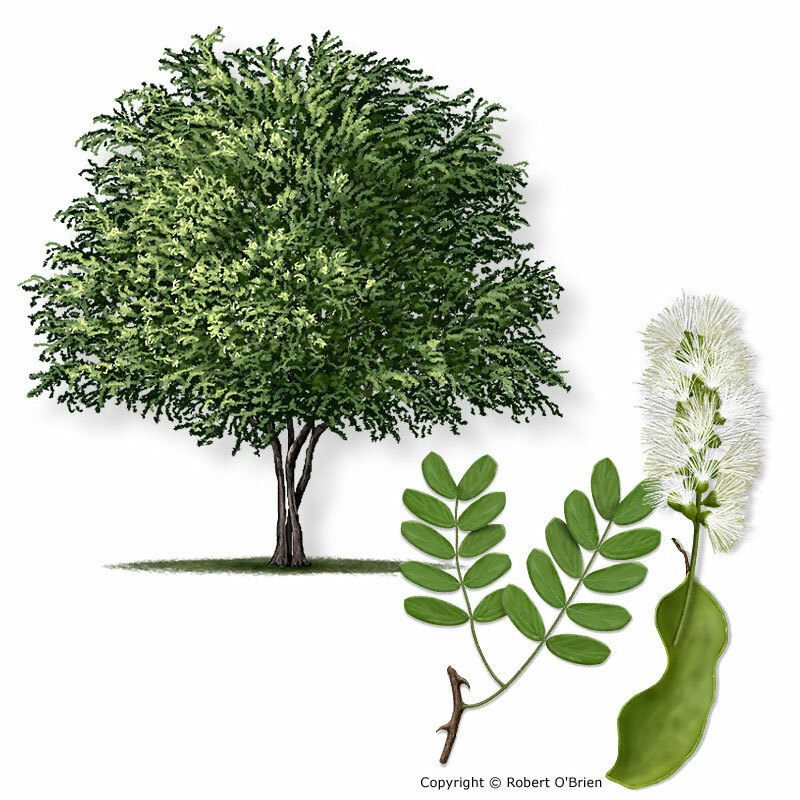 greggii) has leaflets less than 0.25" long; Roemer acacia (A. roemeriana) occurs sporadically in the Hill Country; goldenball leadtree (Leucaena retusa) has larger leaflets and occurs in canyons of the Edwards Plateau and westward.